Max. Current (default 20A or the active Max. Current setting on the connected ESC). Min. Duty (default 4% for R2V, 10% for CL). If the motor cannot start at the lowest duty setting, try raising Min. Duty 2% at a time (although you may also be able to adjust your Advance parameter setting for smoother starts). Telemetry Rate (default 500Hz). Lower this if you face unexpected aborts during the calibration process. 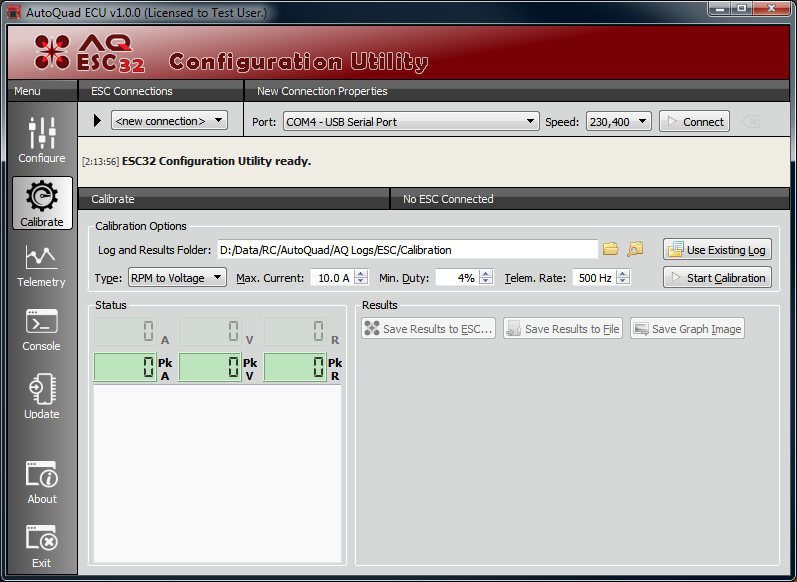 After the options are all properly set and the ESC connected, press the Start Calibration button to proceed. You will get a warning dialog with a chance to cancel the calibration. You can also customize the log file name here (for example you may wish to include the make and model of the motor, the prop size, or other information). Once calibration is started, you may manually abort it at any time by clicking the Abort Calibration button, or pressing Alt-C on the keyboard. 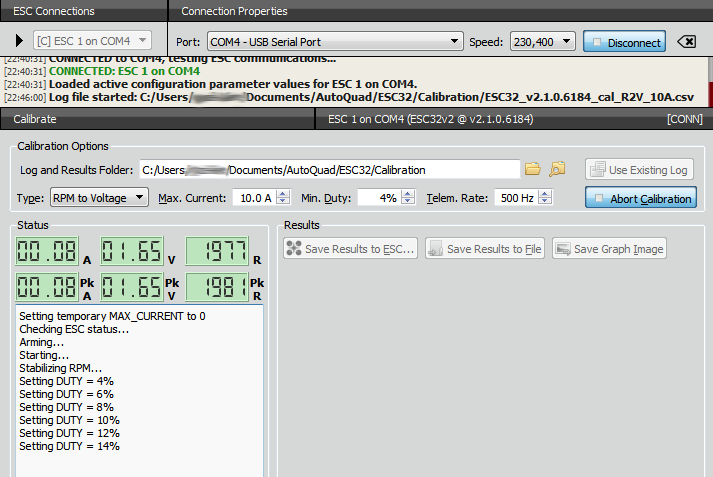 When calibration is finished, the calculated results will be displayed on the screen, and can be saved directly to the attached ESC or in a file for later use. 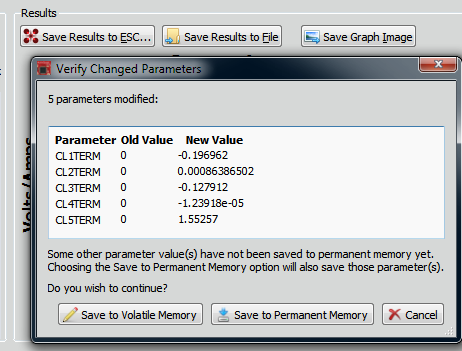 The resulting graph can be saved in a variety of image formats for future reference. 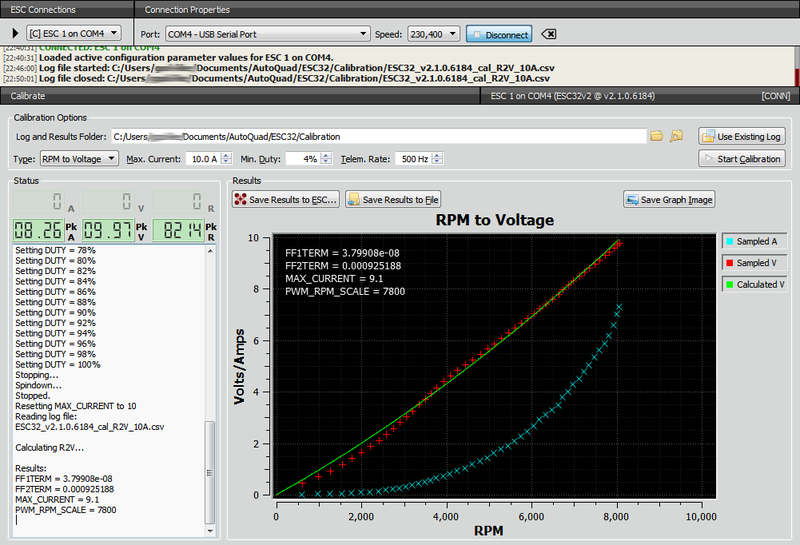 The images here show a typical RPM to Voltage Calibration, resulting in FF1 & FF2TERM and MAX_CURRENT values. The DUTY setting will increase all the way to 100%, or until detected current draw exceeds the Max. Current setting. The starting DUTY of each tested range will progress from 10% to 100%, or until initial detected current draw exceeds the Max. Current setting. 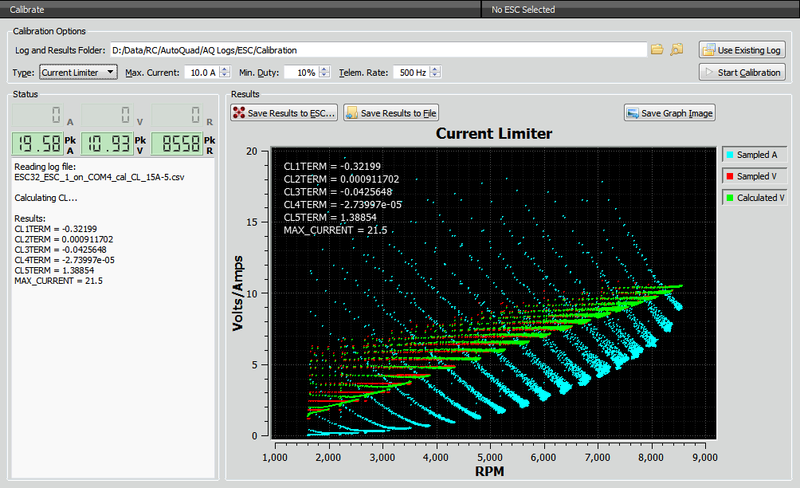 You may also perform a calculation based on data collected during prior calibration runs. 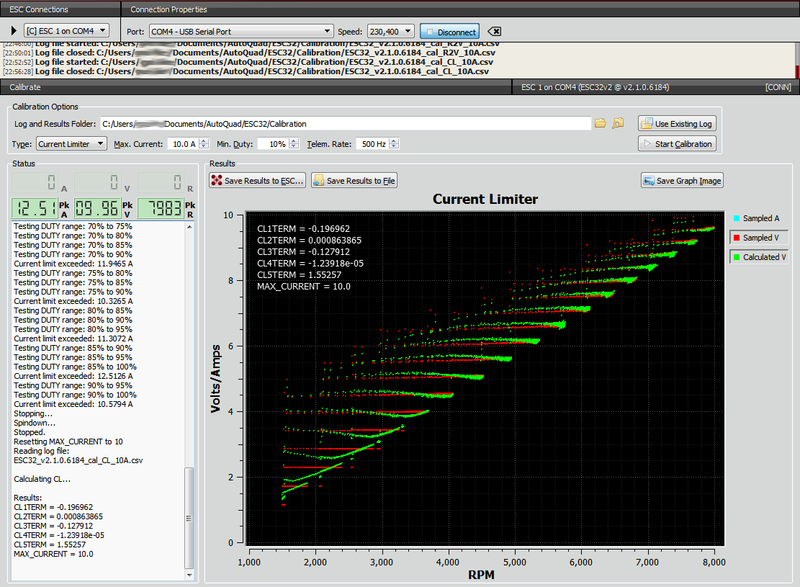 This is done by loading an existing calibration log file using the Use Existing Log button. 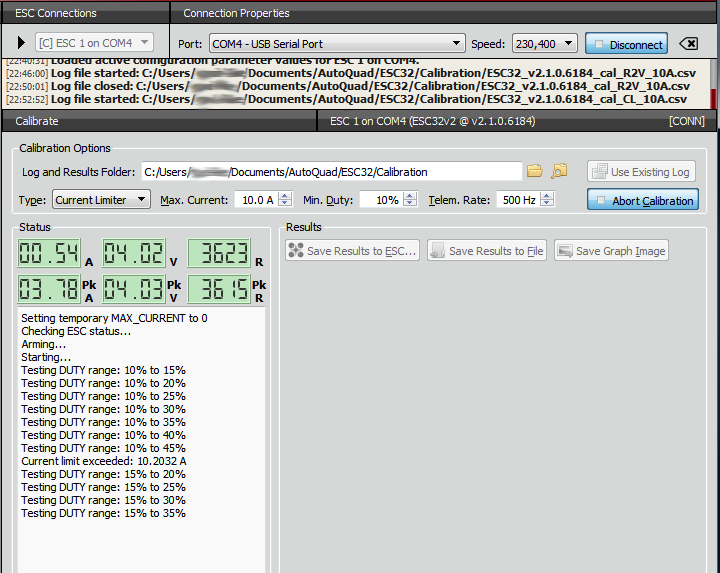 The program will automatically detect the calibration type (R2V or CL) based on the log file contents. This page was created on 22-Aug-15 by MaxP. Last modified on 25-Aug-15 by kinderkram.